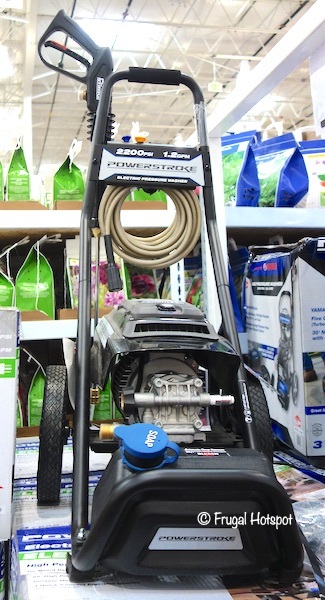 The powerful 120 Volt 13 Amp motor produces 2,200 pounds per square inch (PSI) of pressure and delivers 1.2 gallons per minute (GPM) of cleaning force to clean driveways, decks, windows, walkways and patio furniture. 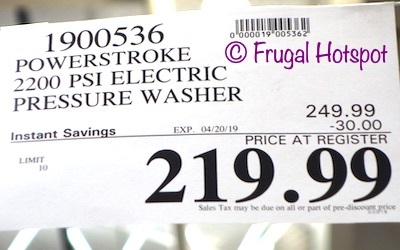 Select Costco locations have the Powerstroke 2200 PSI Electric Pressure Washer on sale for $219.99 (after instant savings), now through April 20, 2019. That is $30 off Costco’s regular price of $249.99. While supplies last. Item #1900536. 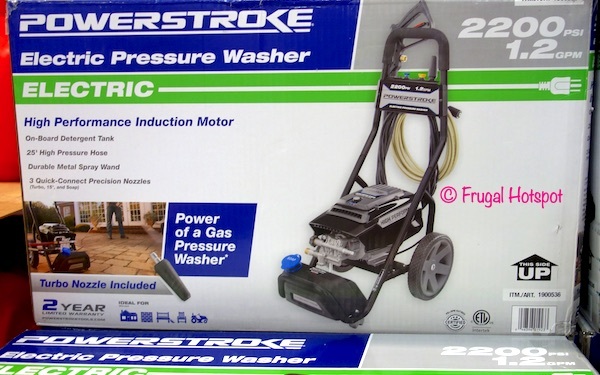 Since this pressure washer is electric, you can avoid the hassle and mess of gas and oil. A metal spray wand and 25′ non-marring, high-pressure hose is included. • Soap nozzle, complemented by an on-board soap tank for easy detergent application.